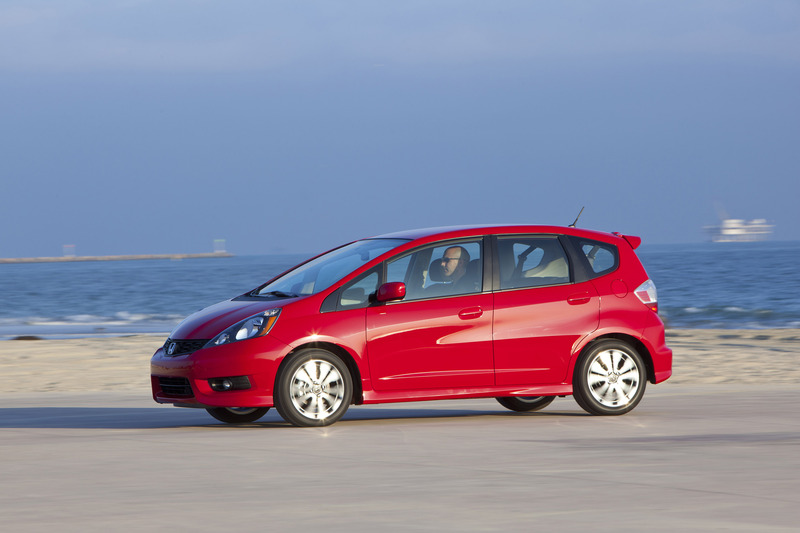 The Honda Fit builds on its proven strengths for 2012 with updated styling on Honda Fit Sport, interior upgrades on all models, and the addition of new standard and available features. The Fit's compact size and tight turning diameter (34.4 feet, curb-to-curb) can conveniently navigate space-confined urban areas and fit in small parking spaces. Yet a roomy and versatile interior offers the convenience and cargo volume of a relatively larger vehicle. 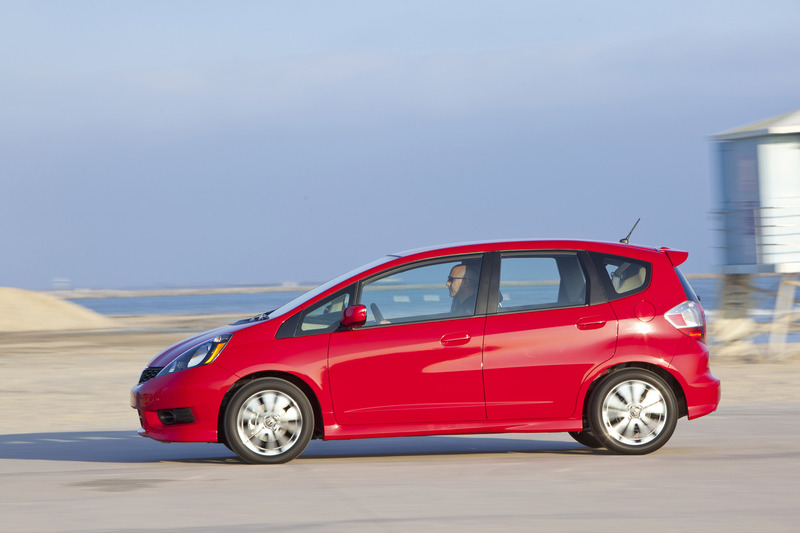 Compared to any other vehicle in the subcompact class, the five-passenger Fit provides the lowest, flattest cargo floor and the most cargo volume of 57.3 cu-ft. when the rear seats are down. Its four distinct seat configurations are designed to accommodate large objects ranging from mountain bikes to surfboards to tall houseplants. 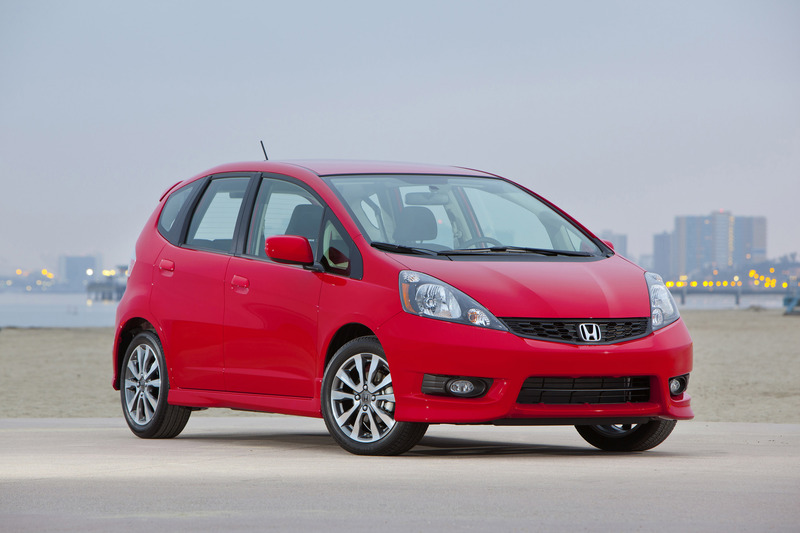 Honda Fit Sport exterior updates for 2012 include new designs for the front grille and bumper, black headlight bezels and a dark "machined surface" finish for the alloy wheels (replaces a painted finish appearance). 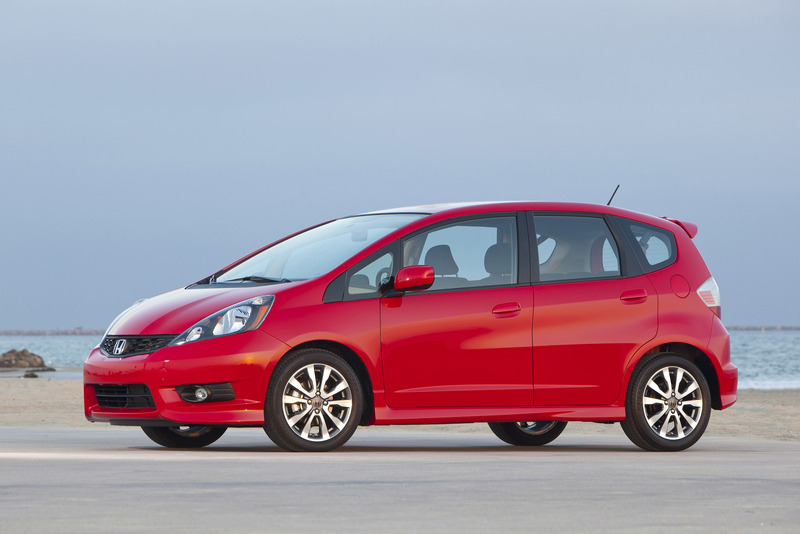 The entry-model Fit retains its exclusive front fascia design and for 2012 receives body-color exterior mirrors (previously black) and updated wheel covers. Inside, the Honda Fit Sport interior is enhanced with dark metallic dashboard components for a unified color theme (replacing the previous gray and black theme). Honda Fit Sport receives additional chrome accents around instrument displays. All models receive newly designed console-mounted center beverage holders along with console ambient lighting, which provide easier access and greater stability. All models also receive added sound insulation measures in the floor, front fenders and A-pillars, plus thicker front corner-window glass, to help create a quieter, more-refined cabin environment. Two new colors are available: Blue Raspberry Metallic and Orangeburst Metallic, which replace similar colors from the prior model year. 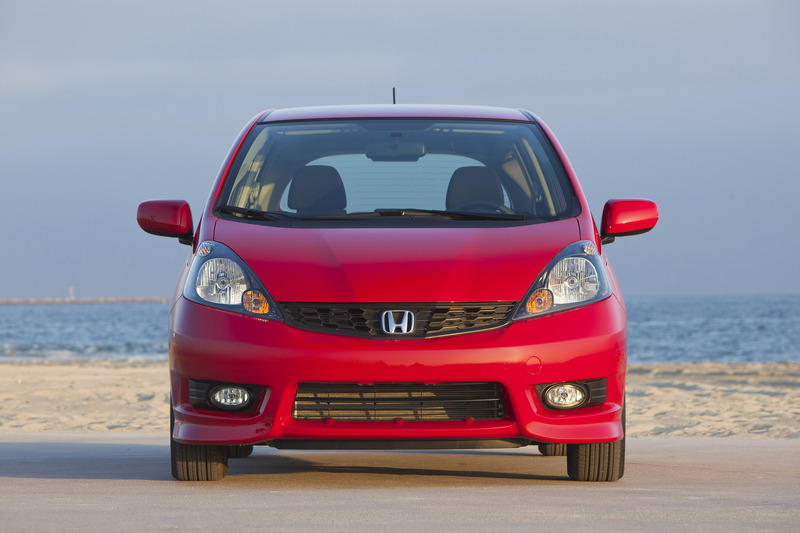 The top-of-the-line Honda Fit Sport includes a long list of exclusive, standard features compared to the entry-model Fit. For 2012, it gains standard steering wheel-mounted audio controls for fingertip operation (previously exclusive to navigation-equipped models) and upgraded seat fabric. When equipped with the Honda Satellite-Linked Navigation System™ with Voice Recognition, the Honda Fit Sport now includes Bluetooth® HandsFreeLink® to help make hands-free telephone calls more convenient. The enhanced system also includes a Bluetooth Audio capability with compatible phones and devices. 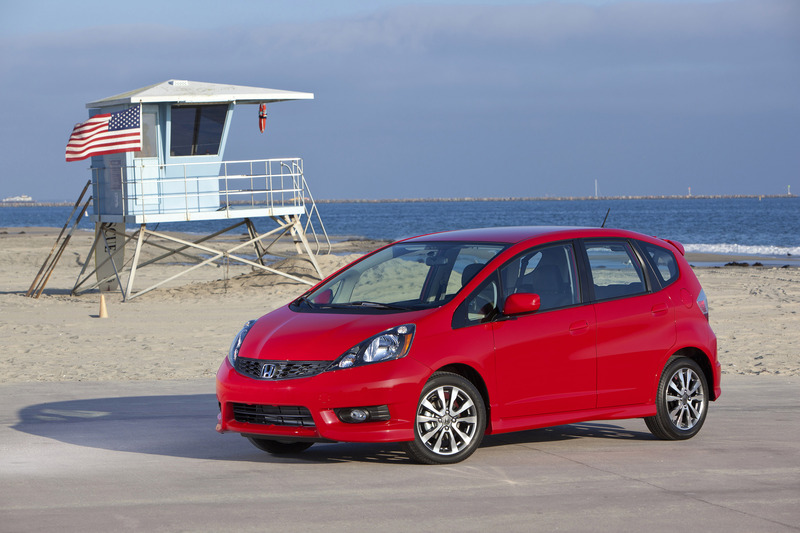 Though the Fit has an overall exterior length of just 161.6 inches, the interior provides an impressive 90.8 cubic feet of passenger volume. There's comfortable seating for up to five passengers, and behind the rear seats, there's 20.6 cubic feet of storage space - much more than you'd find in a typical sedan. For enhanced versatility, the exclusive 60/40 split rear Magic Seat® offers multiple seating and cargo-carrying configurations. With its one-motion dive-down functionality, it can fold flat into the floor to maximize rear cargo volume. The Fit's interior can also be easily converted to tall object mode or long object mode based on the shape of the cargo. 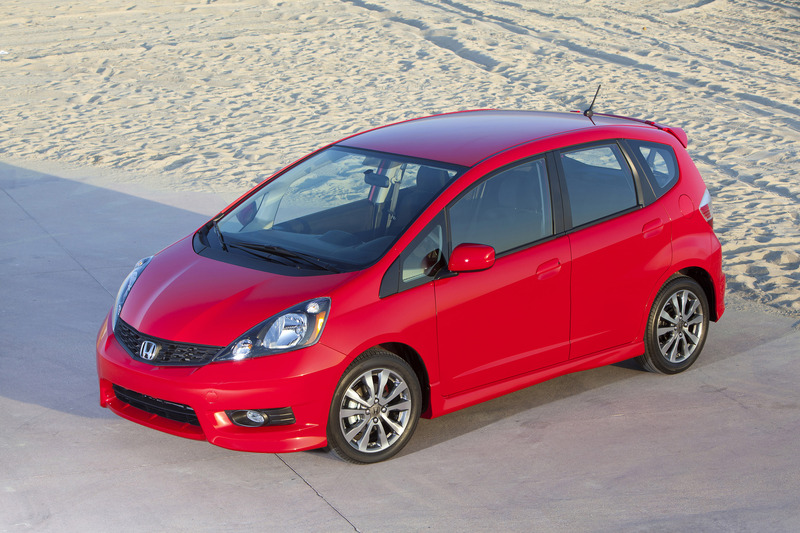 The 1.5-liter, i-VTEC® 4-cylinder engine is tuned to deliver an engaging combination of power and fuel economy. A five-speed manual transmission is standard and a five-speed automatic transmission is available. 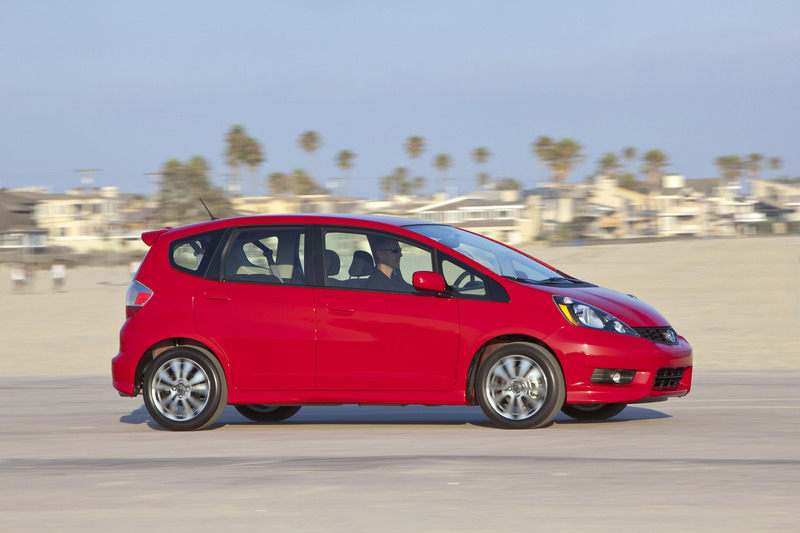 Steering wheel-mounted paddle shifters on Honda Fit Sport models equipped with the available automatic transmission allow for manual gear selection. All models are powered by a four-cylinder engine that produces 117 horsepower at 6,600 rpm and 106 lb-ft. of torque at 4,800 rpm. 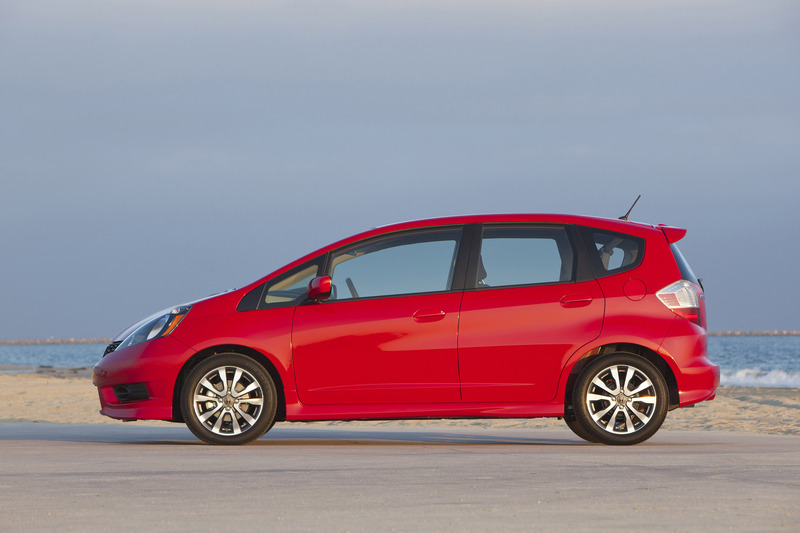 When equipped with the available automatic transmission, the Fit has an Environmental Protection Agency (EPA) city/highway/combined fuel economy rating of 28/35/31 miles per gallon. 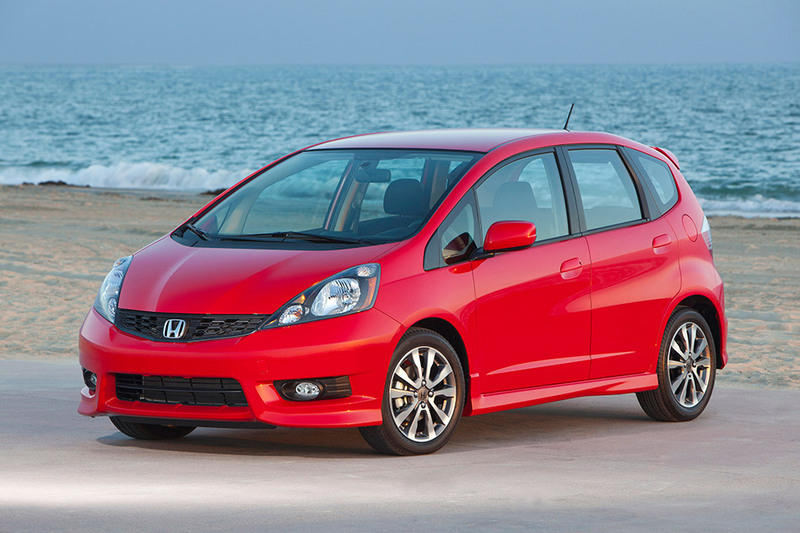 The Honda Fit Sport with the available automatic transmission has an EPA city/highway/combined fuel economy rating of 27/33/30 miles per gallon. All manual transmission-equipped models have an EPA city/highway/combined fuel economy rating of 27/33/29 miles per gallon. A sporty, refined and dynamic driving experience is provided by the front MacPherson strut suspension and torsion beam rear suspension. Fifteen- and 16-inch wheels (Fit and Fit Sport, respectively) feature 175/65 R15 84S (Fit) and 185/55 R16 83H (Fit Sport) tires. The standard anti-lock braking system (ABS) with Electronic Brake Distribution (EBD) uses 10.3-inch ventilated discs in the front and 7.9-inch drums in the rear. All Fit models are equipped with a wide range of standard safety equipment including Vehicle Stability Assist (VSA), the Advanced Compatibility Engineering™ (ACE™) body structure, anti-lock brakes and more. Dual-stage, multiple-threshold front airbags, front-side airbags with passenger-side Occupant Position Detection System (OPDS) and side-curtain airbags are also standard equipment for 2012. Standard comfort and convenience features include air conditioning, cruise control, remote entry, a 160-watt AM/FM/CD audio system with four speakers, a USB audio interface, an auxiliary audio input jack, MP3/WMA playback capability, Radio Data System (RDS), power windows, power mirrors, power door locks and a security system. 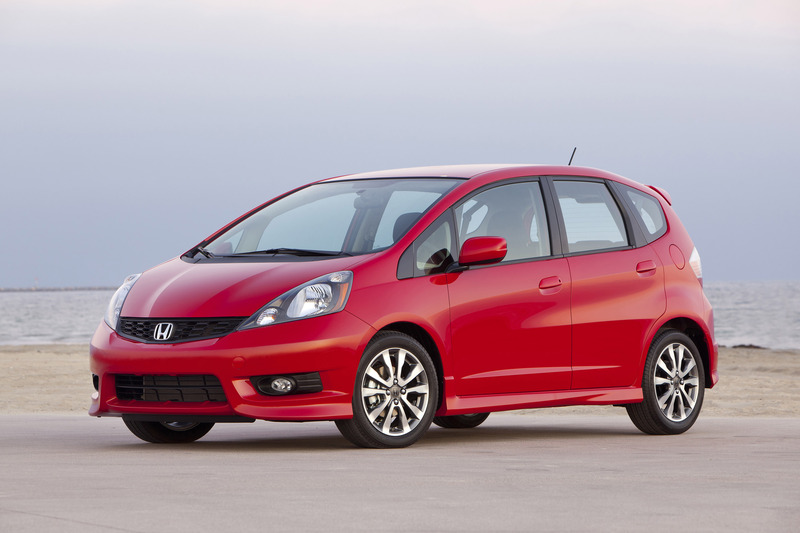 The Honda Fit Sport adds or replaces: alloy wheels, an underbody aero kit, rear roofline spoiler, fog lights, illuminated steering wheel mounted audio controls and upgraded seat fabric. 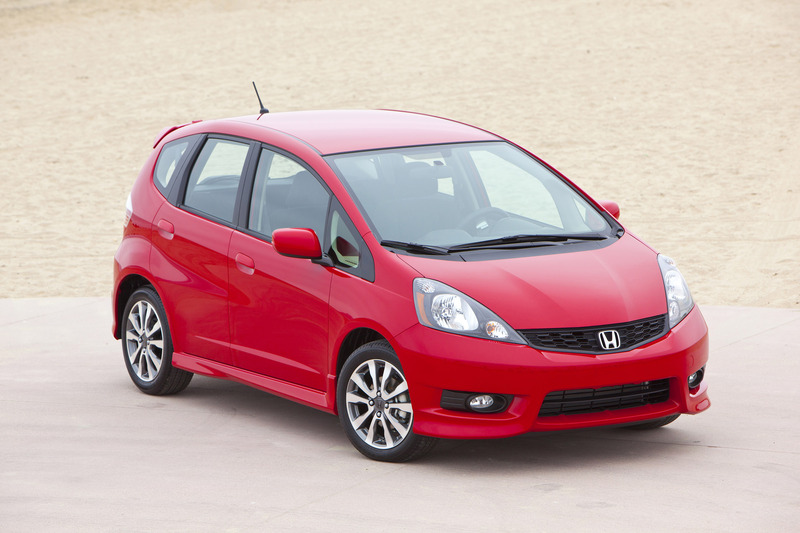 For improved audio performance, the Honda Fit Sport audio system has a total of six speakers. 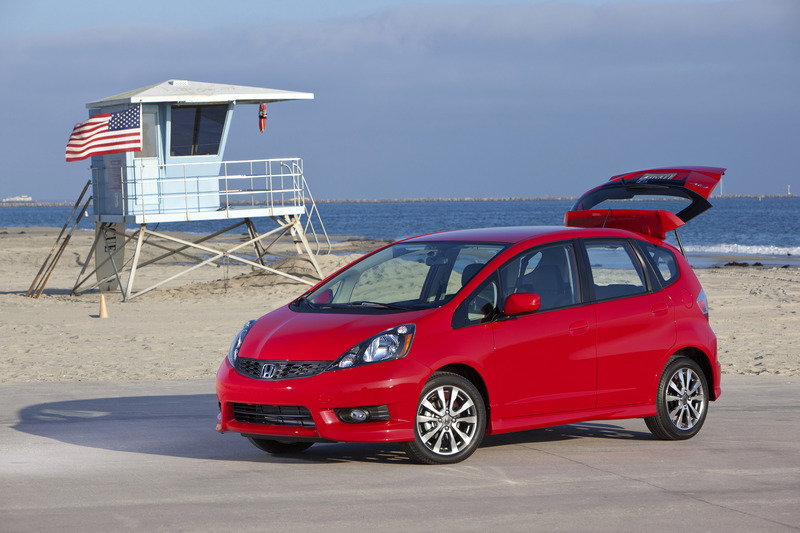 The Fit Sport is available with the Honda Satellite-Linked Navigation System™ with Voice Recognition, which features a 6.5-inch screen and more than seven million points of interest. 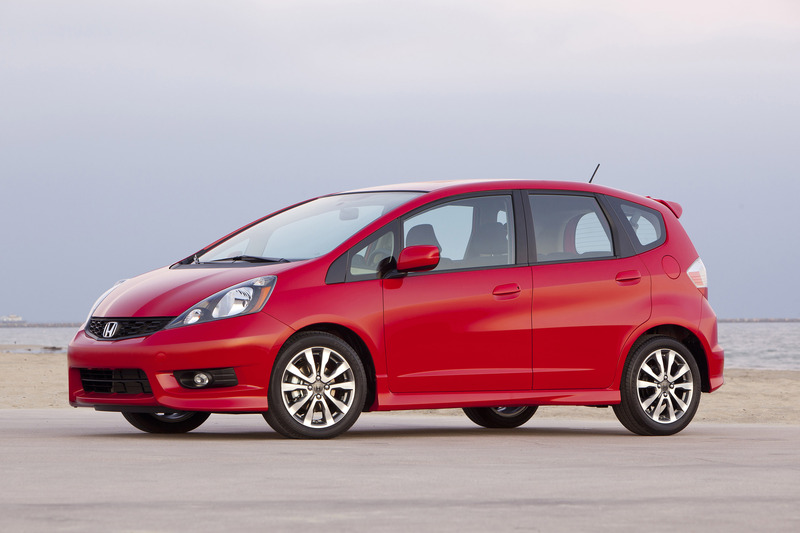 The Honda Satellite-Linked Navigation System debuting on the 2012 Fit Sport features 16 GB of flash memory in place of the DVD-based system used previously. Like other Honda navigation systems, this new system allows simple, intuitive operation and has an extensive on-board database.